So often we demand that laws be enforced, but when they are imposed upon us we can become upset, surprised and even defiant. This form of "selective" law abidance is the root of many problems our country is faced with; the "ideal" of law enforcement but by gosh not on me! Not only do we want to get away with our wrongdoings, many feel justified in doing so. One such example is the taking of lobster during the closed season. Almost everyone I know has been guilty of this, thinking "oh it's just one or two lobsters" how will that make a difference? Of course every culprit rations the same logic, never considering that collectively they are undoing a law that was put in place to protect the species and assure a healthy population that can be harvested when the time is right. Not only does this mentality have no regard for the law, but either the perpetrator chooses to ignore, or is ignorant of protecting and understanding the importance of maintaining ecological balances and managing sustainable resources. They have no regard or knowledge of the impact their actions may have on the population of lobsters and ultimately the livelihood of many in Belize. Considering the level of education most people have, I tend to believe they choose to ignore the law, rather than be ignorant of the consequences. Last week while representatives of the Belize Forestry Department (BFD) confiscated two non-native birds (a cross-bred Macaw parrot and a Moluccan cockatoo) without proper permits from a well-known family here on the island, much of the community was in an uproar. Although the actual confiscation process leaves something to be desired, the bottom line is that the BFD was enforcing the wildlife laws of Belize, and the laws are in place for very good reasons. Just as there are laws on when lobsters can be harvested (to protect the species), the wild bird laws are designed to protect the species as well. Historically the introduction of non-native species, whether intentional or accidental, has proven disastrous to native species and sensitive ecosystems worlwide. Non-native species can begin taking over a new environment as "invasive" — when the local environment is ill-equipped to handle the new species, and it can lay claim to every resource it can access and hurt countlessnative species in the process. As explained by the Belize Bird Rescue who are currently caring for the confiscated birds, should the captive cross-bred Macaw ever escape, the potential for severe damage to the last few breeding pairs of Scarlet Macaws in Belize could be severely compromised should this bird mate with them. Would there have been community outrage had the pet in question been a lion from Africa? The people would say, “Such an animal has no business being in Belize!”And what if the lion escaped and mated with a jaguar, producing sterile offspring and jeopardizing our precious jaguar population? 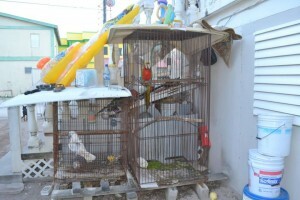 Belize Bird Rescue also points out that without the Convention on International Trade in Endangered Species of Wild Fauna and Flora (CITES) certificates, no breeding history or import permits the birds are effectively illegal immigrants.Both birds were obviously smuggled into Belize and the Moluccan cockatoo may have been wild caught. Moluccan cockatoos are listed as critically endangered birds and are native to the south Moluccas and eastern Indonesia; that's almost as far fetched as having a pet lion from Africa! Yes, it is regrettable that a family had to part with their long-loved pets in such a manner, but laws are made to be upheld, and examples need to be made. Managing wildlife is serious business, especially in a country like Belize where wildlife is an integral part of our tourism package. Regardless of what the law may be, whether we like it or not, they are in place for a reason. As law abiding citizens it is our duty to comply. If we expect exceptions to every rule why bother with having laws at all?